﻿ Qi Gong, chi kung, or chi gung (literally: "Life Energy Cultivation") is the practice of aligning body, breath, and mind for health, meditation, and martial arts training. With roots in Chinese medicine, philosophy, and martial arts, Qi Gong is traditionally viewed as a practice to cultivate and balance qi (chi) or what has been translated as "life energy". Qi Gong practice typically involves moving meditation, coordinating slow flowing movement, deep rhythmic breathing, and calm meditative state of mind. Qi Gong is practiced worldwide for exercise and relaxation, health benefits, meditation and self-cultivation, and training for martial arts. Qi Gong is used to improve health and for preventive means. There are forms to address specific health concerns and to heal the body from various illnesses and injuries. As meditation, Qi Gong is a means to still the mind and enter a state of consciousness that brings serenity, clarity, and bliss. Many practitioners find Qi Gong, with its gentle focused movement, to be more accessible than seated meditation. The practice of Qi Gong is an important component in both internal and external style Chinese martial arts. Focus on qi is considered to be a source of power as well as the foundation of many arts. T'ai chi ch'uan, and Baguazhang are other martial arts that are considered to have Qi Gong as the foundation. Because Qi Gong includes both dynamic and gentle techniques that can be practiced from standing, seated, or supine postures, it is suitable for young and old. Qi gong is practiced by millions worldwide, primarily for its health benefits, though many practitioners have also adopted traditional philosophical, medical, or martial arts perspectives. 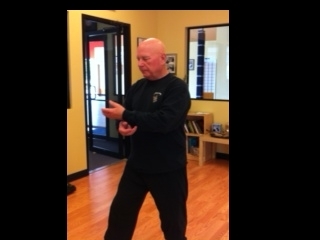 Qi Gong classes at the Abiding Spirit Center are taught by Bill Thomas. Fourteen years ago, Bill Thomas, the owner of Northern Illinois Windows, was looking for, as he puts it, “a healing modality for my daughter.” What he found was martial arts – in particular, Tai Chi, Kung Fu and Qi Gong. Thomas has studied under masters such as Master Howard Hudson of Fox Lake and Master William CC Chen of New York. “They call it a moving meditation,” he said of Qi Gong, “meditative with flow and gentle movements.” He also described it as “energy movement.” Thomas works with students of almost any age. He said he enjoys sharing what he’s learned with others who want to learn to heal themselves. Classes are held Thursdays, 9:00-10:00 am. There is a suggested donation of $5/class. All ages and physical conditions are welcome.